How to create a XSD schema from a class? I'm having a hard time with the XSD files. Please note that I have an abstract class inside of Configuration. With that feature, is it possible to create the XSD and if it's possible how? The idea is to pass the class Configuration to the XSD. All you have to do is compiling your assembly and run XSD.exe with the path to your assembly as argument. XSD.exe /? has a list of all arguments as well. Prevents an extra command window from popping up and keeps a record of the output until you clear it. Probably a good idea. Check if you want to test the output or troubleshoot; otherwise, leave unchecked. Compile your project! XSD.exe only looks at compiled code. Click on the class in Solution Explorer. Click on the Show All Files button in the Solution Explorer. 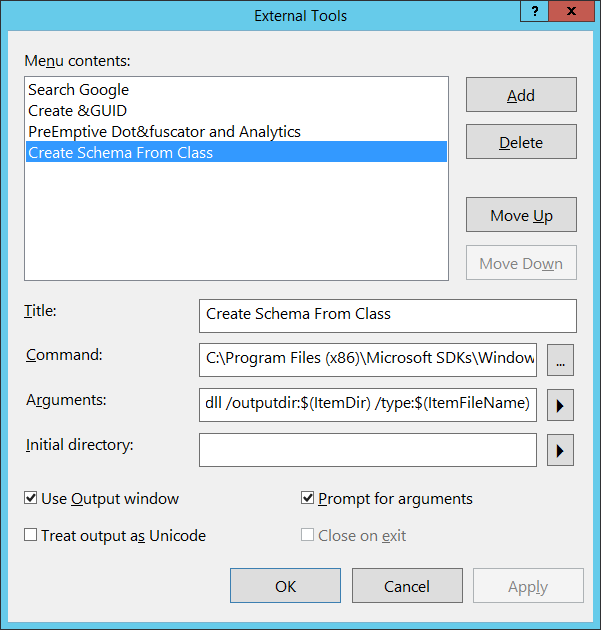 Look in the same folder as your class and you will see Schema0.xsd. (optional) You may have to edit this new xsd by hand if you want to edit xml files in the xml editor using this schema and you are not using all attributes. You can replace use="required" with use="optional" to get rid of the blue squiggly lines in the xml editor (which create warnings), if indeed these attributes are not required. 2222 Is it correct to use inheritance instead of name aliasing in c#? 6854 What is the best standard to use for business document exchange (invoices, POs etc)? 1606 Define an xsd:list where each item must be unique? 4397 How to allow any number of any attributes with XSD? 2783 Xsd.exe Any Type to XmlElement conversion. How to fill generated property? 6543 How to save and get values from an Xml without cast? 6486 How can I use Linq with Dataset.xsd files? HTTP synchronous request stops my GIF moving in Chrome and IE? How to join the newest rows from a table? Methods for caching PHP objects to file?